We will pick you up from the hotel in Taba with private modern vehicle to Nuwibaa port, board the ferry boat to Aqaba, meet in port then drive directly to Petra. 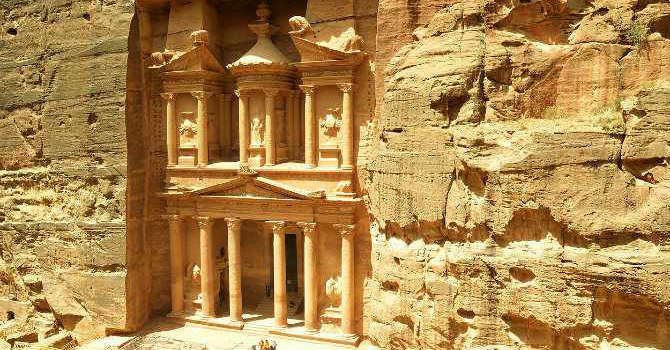 Located about 3 hours south of Amman and surrounded by airy hills of oxidize colored sandstone giving the city a kind of natural protection against aggressors. Wander the amazing red rose city of the Arab Nabateans also known as "the lost city", it is all carved in the mountain rocks. Start with horse back riding along the Siq Canyon, it is a natural crack in the rocks extends to one Kilometer leading to the Roman Theater, Royal Tombs and Roman colonnaded street. Admire the Great Treasury, Qasr Al-Bent & the archaeological museum. get your lunch then transfer back to Aqaba city for free time getting around and shopping before boarding the ferry boat back to Egypt then transfer to your hotel in Taba.